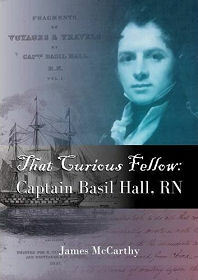 "That Curious Fellow: Captain Basil Hall, RN" is a biography a notable Scot who despite his wide ranging and considerable achievements has managed to be largely overlooked by history. Author James McCarthy has written numerous books about Scotland and its people, and clearly has a particular fascination for Scottish travellers and explorers. Captain Basil Hall, RN, certainly qualifies to be included among any list of far-travelled Scots, yet he was also far more as well. The author takes a broadly chronological approach to Captain Hall's story, while also picking out discrete strands of his life, especially where his relationships with well known figures of his day are discussed. The introduction notes that Captain Basil Hall was "directly involved in both the Peninsula War and the liberation of South America. His friends and acquaintances provide a roll-call of some of the great scientific and literary figures of the first half of the 19th Century... while he also corresponded with several prime ministers of his day. He himself became a celebrity writer with his popular books on travel and naval life." The book begins with Basil Hall's early life in an aristocratic household at Dunglass in the Borders, before joining the navy with his family's blessing at the age of 13. He went on to serve in Nova Scotia before becoming involved in the Peninsula War. Captain Hall spent just over 20 years as a naval officer engaged on a variety of duties in many (indeed, most) parts of the world, and he then spent the following two decades as an independent traveller, often accompanied by his wife, their young family, a nursemaid and a governess. During this latter period he built on the reputation he had gained as an author writing about the places he visited with the Royal Navy, but he also branched out into a range of scientific investigations. During this period he came to know, and frequently corresponded with, key literary figures such as Sir Walter Scott and Charles Dickens, and scientists such as Sir John Herschel, Mary Somerville and Sir Humphry Davy. The result is a good read about a truly fascinating man, skillfully brought to life by an author not afraid to show his subject's negative traits as well as his many positive ones. It is good to see Captain Basil Hall put back on the historical "map" of his age through James McCarthy's comprehensive research and engaging style.